The right-wing Democratic Party of Serbia (DSS) on Wednesday called on the government to stop all work on the planned Nis-Pristina-Tirana-Durres highway, because it is “contrary to the national, security and economic interests of Serbia”. The DSS claimed that the highway - the first stretch of which could be finished by 2020 - would be built with Serbian money in Albania’s interests, describing it as a “highway of Greater Albania”. Macedonia's new Parliament Speaker Talat Xhafer has formally entered his cabinet and assumed his new duty on Wednesday morning. 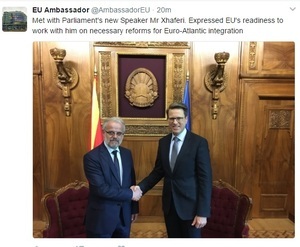 Xhaferi had his first meeting in his cabinet today with the EU ambassador to Macedonia Samuel Zbogar who has expressed EU's readiness "to work with him on necessary reforms for Euro-Atlantic integration". 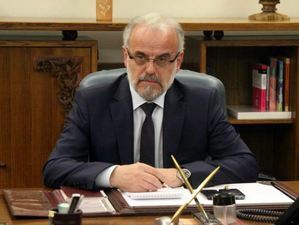 It is expected that one of Xhaferi's first moves is to send a formal letter to the Macedonian President Gjorge Ivanov, informing him that there is a new majority in parliament to which he should award the mandate for the formation of new government. By law, Ivanov has ten days to respond positively to this letter and award the mandate to the leader of the new majority, the head of the Social Democrats, Zoran Zaev. Xhaferi's election on Thursday sparked violent rampage of former ruling VMRO DPMNE party supporters in parliament. Transparency International called on Wednesday the ejection of its partner organisation MANS from a European Union anti-corruption working group on Montenegro accession completely unacceptable and an indication that the government is not taking the fight against corruption seriously. “The government has removed the strongest anti-corruption organisation from the working group on anti-corruption without giving any reason. This is a violation of procedures and sends the wrong message about its attitude to fighting corruption,” the Transparency International said. Macedonia's former Prime Minister and leader of the right-wing VMRO DPMNE party, Nikola Gruevski, appeared at Skopje Criminal Court on Wednesday at his trial for allegedly ordering an attack on an opposition mayor and his municipality HQ in 2013. The Special Prosecution, tasked with investigating allegations of high-level crime mainly concerning top officials from the former ruling VMRO DPMNE, charged Gruevski and 13 other people with allegedly ordering a failed attack on the opposition mayor of Skopje's Centar municipality, Andrej Zernovski during protests outside the municipal HQ. Serbian journalists’ associations have decried the state of the country’s media on World Press Freedom Day, citing political pressures on the media and harsh economic conditions. The Journalists’ Association of Serbia said that the media are impoverished and dependent on the centres of power, while falling ethical standards, self-censorship, clientelism and “tabloidisation” are pervasive. The Independent Association of Journalists claimed that PM Aleksandar Vucic has monopolised the public arena and the ruling party is using the media for its own interest while journalists are losing their jobs or working for low salaries even in profitable companies. Belgrade mayor Sinisa Mali will probably resign during the summer because of the protest campaign against him, Serbian Prime Minister Aleksandar Vucic told journalists in Belgrade on Wednesday. Mali recently stated that he plan to resign, but didn’t say why, although protest group Let’s Not Drown Belgrade has called for his resignation several times during demonstrations accusing the city authorities of being responsible for nocturnal demolitions by masked men in the Savamala district a year ago. Romanian civil society activists called for new protests via social media on Wednesday after senators on the Justice Commission decided to include graft-related sentences in a pardon bill that the Social Democrat government has been pushing since the beginning of the year. A similar decree including pardons for graft offences, adopted by the government at the end of January, was withdrawn due to large protests across Romania, as activists accused the government of trying to relax anti-corruption legislation. The Administrative Court of Tirana has thrown into disarray a project to build a 100 million euro hydropower plant on the Vjosa River in southern Albania. The court accepted the claims of 38 families from the village of Kute, whose land was to be inundated by the project, and the claims of three environmental NGOs that wanted to protect Vjosa, which is considered the last wild river in Europe. “This is a happy day because this is the first time that citizens have prevailed against the arbitrary decisions of the government,” Vladimir Mece, an attorney representing the families, told BIRN. A new survey by journalism organisation BH Journalists and the Friedrich Ebert Foundation in Bosnia suggests that people’s trust in the media has decreased by 27 per cent since last year, although 57 per cent of those questioned still said they trust the media. The survey suggested that fewer people than last year believe politicians are the biggest influence in the media, but more believe that the influence of media owners and editors is on the rise. Hundreds of Romanian protesters gathered in front of the government headquarters in Bucharest after senators on the Justice Commission decided to include graft-related sentences in a pardon bill that the Social Democrat government has been pushing since the beginning of the year. A similar decree passed by the cabinet at the end of January triggered the country's largest protests after 1989. Serb National Council (SNC) that unites members of the community of ethnic Serbs living in Montenegro has filed a petition with the authorities of the country’s old royal capital Cetinje to erect a monument to the last Russian emperor as a symbol of gratitude to the Russian Czars for centuries of assistance to Slavic people. "We are turning to you with an initiative to erect a monument to Czar Nicholas II Romanov of Russia," says the petition, a copy of which the SNC sent to the TASS bureau in Belgrade. 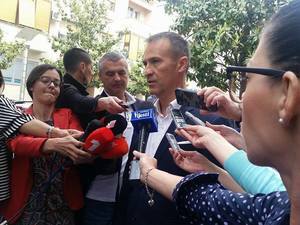 SNC leader Momcilo Vuksanovic told TASS the Council had sent an official letter to Mayor Aleksandar Bogdanovic and the president of Cetinje city hall, Jovan Martinovic. It lists the historic landmarks in the Montenegrin-Russian relations, which started in 1711 when Czar Peter I sent his emissaries to Montenegro. Twenty-four members of the European Parliament have called on the Bosnian government to solve the issue of the financing of the country’s highly indebted public broadcaster, BHRT, which may be facing shutdown. “The collapse of the national broadcaster is unacceptable for a country that is a member of the Council of Europe, and which is opening negotiations to join the European Union,” said a letter from the 24 MEPs, which was made public by BHRT. The UN children’s agency UNICEF said on Thursday that an estimated 24,600 refugee children are currently stranded in Greece, Bulgaria, Hungary and the Western Balkans, and are at risk of psychosocial distress caused by living in a protracted state of limbo. 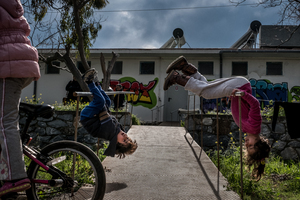 The situation is particularly acute for single mothers and children stuck in Greece or the Balkans waiting for reunification with family members in EU countries, UNICEF warned. Bulgarian PM Boyko Borissov’s third cabinet - a coalition between his centre-right party GERB and the nationalist United Patriots grouping - took its oath before the National Assembly on Thursday. The cabinet team, consisting of 22 ministers and four deputy prime ministers, was approved by the MPs with 133 votes in favour, 101 against and no abstentions. Earlier on Thursday, Borisov handed the list of his ministers to President Rumen Radev, and the official ceremony of taking office at the Council of Ministers is to start shortly. Macedonia's new parliamentary speaker Talat Xhaferi is paying an official visit to Brussels on Thursday, his office said. 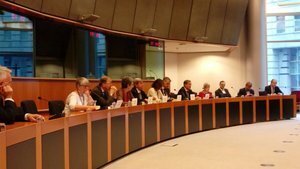 His invitation by top EU representatives to make the trip, which was not pre-announced, is seen as yet another confirmation of his legitimacy in the position, which is disputed at home by the former ruling VMRO DPMNE party. Xhaferi's election by the new majority last Thursday caused supporters of the VMRO DPMNE party to storm the parliament building and injure some 100 people including MPs and journalists. The Serbian government’s coordinator for southern, mostly Albanian-populated municipalities, Zoran Stankovic, met the president of the country’s National Council of Albanians, Jonuz Musliu, on Thursday, after which he told the press that Musliu did not question Serbia’s sovereignty in the south. Musliu had publicly supported the unification of Albania and Kosovo, saying that the Presevo valley in southern Serbia should be included in the union. Stankovic told Serbia’s state-owned news agency Tanjug that he and Musliu agreed to work together in order to solve local problems in that region. 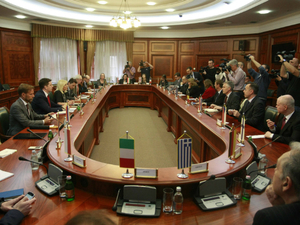 Amid tensions between Serbia and Albania, Kosovo and the Macedonian opposition, Serbian EU integration minister Jadranka Joksimovic and the director of the government’s Office for Kosovo, Marko Djuric, met ambassadors of 20 EU countries on Thursday to talk about regional stability. Joksimovic told the ambassadors that Serbia expects Brussels to play a more active role in stabilising the Balkan region, while Djuric reaffirmed his country’s dedication to the ongoing EU-sponsored negotiations with Pristina. 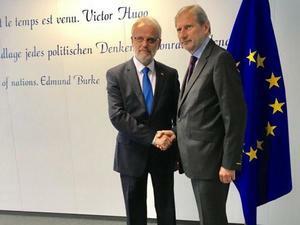 Welcoming the election of new Macedonian Parliament Speaker Talat Xhaferi who is paying an official visit to Brussels on Thursday, Europran Enlargement Commissioner Johannes Hahn called for the focus in Macedonia to now be on the next steps of the process of government formation. "The Parliament must now be allowed to work unhindered. All MPs, including the opposition, are expected to play a constructive rather than obstructive role, and all actors must refrain from provocative statements and actions" Hahn wrote in a press statement after meeting Xhaferi. After Bosnia’s House of Peoples decided on Thursday to discuss a proposal to change the country’s election law under an urgent procedure - as proposed by the Bosnian Croat club in the chamber - the Bosniak club decided to trigger the ‘vital national interest’ mechanism, which could block adoption of the change. The constitutional mechanism works as a veto, and can be initiated if most members of an ethnic/national club in the chamber deem a decision to be damaging for their vital national interests. Russian news agency Sputnik reported on Thursday that the leader of the Autonomous Democratic Party of Serbia, Andreja Mladenovic, will replace the scandal-plagued Sinisa Mali as mayor of Belgrade. BIRN could not independently verify the report. Prime Minister Aleksandar Vucic announced this week that Mali, who has been accused of involvement in the controversial night-time demolitions in Belgrade’s Savamala district, will be stepping down in the summer. Investigative journalists have also alleged that Mali bought 24 luxury apartments on the Bulgarian coast as a representative of two off-shore companies. The Center for Free Elections and Democracy (CESID) said on Thursday in its report about the April 2 presidential elections in Serbia that they were conducted in accordance with the law, with respect for the fundamental rights of citizens, although there was some inequality among the election’s participants. The Executive Director of CESID Bojan Klacar said that this inequality was reflected in the mixing of state and political positions, and that the prime minister and presidential candidate of the ruling coalition, Aleksandar Vucic, dominated the campaign. Serbia’s Commissariat for Refugees will displace all refugees from downtown Belgrade within the next twenty days and place them in designated camps. Many refugees are currently sleeping in Belgrade parks due to their proximity to the main bus and railway stations. State secretary in the Ministry of Labour, Nenad Ivanisevic, told the national broadcaster, RTS, that one of the reasons for the displacement are complaints from locals and students from the nearby Faculty of Economy. Incidents involving refugees that were reported in the media thus far concerned fights between groups of refugees, or with alleged people smugglers. Croatian President Kolinda Grabar Kitarovic is holding brief talks with all parliamentary leaders and individual MPs in order to get an insight into “the balance of power in the parliament” between the government and the opposition, amid a crisis in relations between the senior party in government, the Croatian Democratic Union, HDZ, and its junior partner, the Bridge of Independent Lists, MOST. After the talks between 2.30pm and 3pm, Grabar Kitarovic will address the public about the situation. Kadri Veseli, the speaker of Kosovo Parliament and the leader of the biggest party, PDK, has warned that time-wasting by politicians has “delayed [EU] visa liberalisation for Kosovar citizens”. “In Kosovo, far too much time has been spent on issues such as border delineation with Montenegro or the Association of the Serbian Municipalities,” Veseli wrote in an article for the Euractiv website. “We’ve experienced economic growth but it has not translated into massive job creation, especially for young people,” he also said. Croatia’s senior governing party, the Croatian Democratic Union, HDZ, announced that it has the support of 76 MPs to name the new parliament chairperson - after the previous one, Bozo Petrov, the leader of the former junior governing party, the Bridge of the Independent Lists, MOST, resigned on Thursday. Parliament will vote on the new chairperson on Friday afternoon and the HDZ insists that this will give it the necessary majority in the 151-seat legislature. The opening trial of two Montenegrin opposition leaders and 12 others over an alleged coup attempt has been postponed on Friday after the legal representatives of indictees asked for more time to prepare the defence. 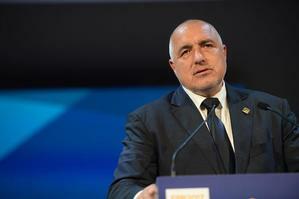 The trial is to resume in the High Court in the capital Podgorica on May 24. On April 13, the Special Prosecutor for Organised Crime, Milivoje Katnic, filed an indictment against 12 others, two Russians, nine Serbian citizens and one other Montenegrin, accusing them of having played roles in last October’s alleged coup plot. The indictees include the former commander of an elite Serbian police unit, the Gendarmerie, Bratislav Dikic, arrested in Montenegro on October 16, and Russian military intelligence officers Eduard Shishmakov and Vladimir Popov. Milan Petrovic, legal representative of the Serbian police general Bratislav Dikic. Photo: BIRN. The political atmosphere is likely to become changeable as Albania approaches national elections on 18 June 2017, the UK government warned on Friday. "Monitor local and international media, take extra care and avoid political rallies and demonstrations. Don’t attempt to cross any roadblocks set up by protesters as this might provoke a violent reaction," the statement reads. A municipal election is due to be held in Kavaje on Sunday 7 May 2017. There’s a significant risk that the planned protests may turn violent. You should take extra care and keep well clear of all demonstrations. 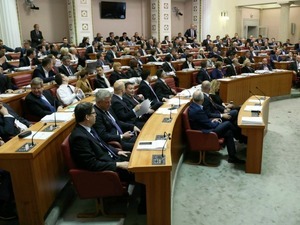 Four House of Representatives lawmakers who have recently left the Parliamentary group of the main Bosniak party in Bosnia – the Party for Democratic Action (SDA) – have on Friday requested to start their own Parliamentary group in the chamber – the „Independant Block“ (Nezavisni Blok), according to local media. The four lawmakers had recently voted against an increase in excise taxes on fuel, contrary to the stance of SDA leadership – leading towards one of them being kicked out of the party, while the other three were warned.